MILWAUKEE, Wisconsin, July 31, 2017 – The Symetra Tour, the official qualifying Tour for the LPGA, rolls back into Milwaukee for the third annual PHC Classic at Brown Deer Park Golf Course. Tournament play begins on Friday, August 4 and the final-round is scheduled for Sunday, August 6. Play will begin at 7:30 a.m. all three days of the tournament. There will be a cut to the low 60 and ties following second-round play on Saturday, August 5. In addition to competing for the $100,000 total tournament purse, the field of 156 players are also vying for the final two spots in The Evian Championship, the fifth and final major on the LPGA Tour schedule. The PHC Classic is the official U.S. qualifier for The Evian Championship. This is the second year that a Symetra Tour tournament has served as a qualifier for The Evian Championship. Last year, Laura Gonzalez Escallon and Ally McDonald finished one-two at the FireKeepers Casino Hotel Championship to earn trips to France. They both went onto make the cut with McDonald finishing T30 and Gonzalez Escallon placing T55. The Evian Championship is September 14-17 this year. The PHC Classic will feature an increased field size of 156 to accommodate 12 additional LPGA Tour members that are in the field to try and earn a spot in The Evian Championship. The winner’s payout is $15,000. With seven events remaining in the 2017 season, each dollar earned becomes critical. The top 10 earners at the end of the season receive LPGA Tour membership for 2018. The season concludes with the Symetra Tour Championship from October 5-8 in Daytona Beach, Fla. The chase for a Tour card tightened last week at the FireKeepers Casino Hotel Championship. No. 10 Kendall Dye (Edmond, Okla.) has just a $2,532 cushion on No. 11 Lindsey Weaver (Bellefontaine, Ohio), who finished in a tie for fourth last week. The $15,000 first-place check could move anyone inside the top 18 to the top 10. Last year, Laura Gonzalez Escallon made birdie on the 54th hole to best Erynne Lee by one shot to win the PHC Classic. Annie Park won the inaugural event in 2015. Both Gonzalez Escallon and Park went onto finish in the top 10 on the money list and are currently competing on the LPGA Tour. The PHC Classic is the third tournament in a three-week stretch that started in Rochester, New York and continued to Battle Creek, Michigan last week. The PHC Classic is the lone Symetra Tour event in Wisconsin. The field is loaded this week as eight of the top 10 on the current Volvik Race for the Card money list are scheduled to compete including No. 2 Benyapa Niphatsophon (Bangkok, Thailand), who has four second place finishes, No. 3 Erynne Lee (Silverdale, Washington), who has won two of the three events and No. 4 Celine Boutier, who has a win this season. Of the top 20 on the money list, 15 are in the field. There are 30 LPGA Tour members in the field. The field has great representation from Wisconsin born and bred golfers. The Wisconsin players are Lisbeth Brooks (Waunakee), Allyssa Ferrell (Edgerton), Jessie Gerry (Madison), Jenna Peters (Kohler), Casey Danielson (Osceola) and Gabby Curtis (Altoona). Brooks won the 2013 Wisconsin Women’s State Open. Ferrell, who plays the LPGA and the Symetra Tour, placed third at the 2009 Wisconsin Girls Division 2 State Championship. She was named the Wisconsin High School Golf Coaches Association Player of the Year in 2009. Peters was a member of Kohler High School Boys State Championship team as a senior in 2011. She was the CLC (Central Lakeshore Conference) Player of the Year. Brown Deer Park is best known for hosting Tiger Woods’ debut in the Greater Milwaukee Open on August 29th, 1996. There is a plaque near the 10th tee with the quote “Hello World” that Tiger delivered at his press conference the day prior to his debut. The course is a par-72 and will play 6,494 this week. GABBY CURTIS EARNS FINAL SPOT IN MONDAY QUALIFIER: Gabby Curtis (Altoona, Wis.), who played in the PHC Classic two years ago, ran away from the field in the Badger Mutual Insurance Women’s Amateur on Monday at Brown Deer Park to earn the final spot in the field for the PHC Classic. Curtis shot a 72 (par-73) on Sunday and a 5-under, 68 on Monday to win with a two-day score of 6-under, 140. She won by six shots over Mikayla Smith, who turned in two rounds of 73. Curtis made eagle on holes one and 13. Curtis said that a realistic goal this week would be to make the cut. Curtis said she does have aspirations to play professional golf after graduating from Wisconsin. 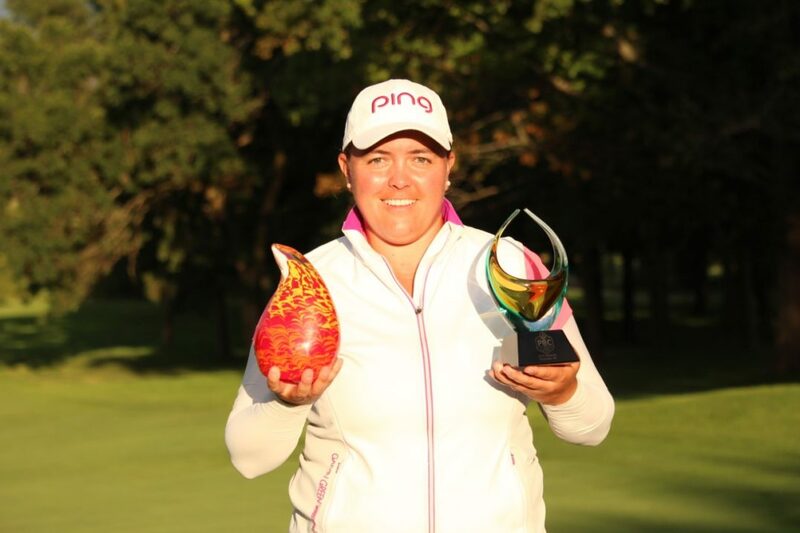 RECAP OF LAST WEEK, LEE WINS AGAIN: There is probably nobody in women’s golf (LPGA included) that has played better over the last month than Erynne Lee, who fired a 5-under, 67 to win on Sunday in Battle Creek, Michigan for the second time in a span of three tournaments. Lee moved up from fourth to third and is in a great spot to stamp a ticket to the LPGA for 2018. Lee and Benyapa Niphatsophon were tied with three holes to play. Lee drained a 27-foot birdie putt on the par-3 16th. She also made birdie on 17 to take a one shot lead to 18 and made par to win by two. The emergence of Lee has been a major story on Tour over the last eight weeks. She earned under $3,000 in her first seven events this season and has earned over $68,000 in her last eight starts. TOP LPGA PLAYERS IN THE FIELD: There are 30 LPGA members in the field this week and many that play week-to-week on the big tour. They are all in the PHC Classic to try and earn one of two spots in The Evian Championship. Here are some notable names. Mariah Stackhouse – The former Stanford All-American has made ten starts in her first full season as an LPGA Tour member. Her best finish is a tie for eighth at the Thornberry Creek LPGA Classic in Green Bay. She currently ranks No. 107 on the LPGA Tour money list. Stackhouse has also played in six Symetra Tour events this year. She finished in a tie for second at the Symetra Classic in her home state of Georgia. Dori Carter – She has played full-time on the LPGA Tour since 2011 and has two career top 10’s on the LPGA. Carter’s best finish this year is a tie for 32nd at the Volunteers of America North Texas Shootout. She has made 117 career starts on the LPGA and has earned nearly a half-million dollars. She was an All-American at Ole Miss in 2008. Julieta Granada – She won the 2006 ADT Championship to become the first women’s golfer to earn a one million dollar payday. Granada has had a long and successful career on the LPGA with 28 top 10 finishes and earnings over $4 million. Alejandra Llaneza – She represented Mexico at the 2016 Olympic Games in Rio. Llaneza has made four starts on the LPGA this year and her best finish is a tie for 20th at the Thornberry Creek LPGA Classic. HARD TO WIN OUT HERE: Ask any of the players that have spent more than a year on the Symetra Tour and they will tell you that it is becoming harder and harder to win. The competition each year takes a step up. The winning score has been in double-digits in four straight tournaments and six of the last seven. Through 15 tournaments, there have only been four winners under 10-under. 2017 DINAH SHORE TROPHY WINNER DEBUTS: Casey Danielson of Osceola will make her Symetra Tour debut this week. She was named the 2017 Dinah Shore Trophy recipient in May. The award is given annual to a top collegiate female golfer who has made an impact on the course through her leadership and on society through charitable endeavors. Danielson, a four-time Wisconsin state champion at Osceola High School, was part of a Stanford team that won the Pac-12 Championships in 2014 and the NCAA Championships in 2015. She earned First-Team All-Pac 12 honors in 2017. She was also a WGCA Second Team All-American. She is also a founder of ‘Birdies for a Cause’ in Wisconsin, which raises money for local and national non-profit organizations by connecting community pledges with golfer performance. Danielson is also a sponsor exemption into the next Symetra Tour event in Sioux Falls, South Dakota (Sioux Falls GreatLIFE Challenge). In May, Danielson celebrated her 22nd birthday by qualifying for the 2017 U.S. Women’s Open at a regional qualifying site in Minnesota. She missed the cut at the U.S. Open by just two shots with rounds of 76-73. FINAL POTAWATOMI CUP EVENT: The PHC Classic is the fourth and final Potawatomi Cup event. The Potawatomi Cup, which started in 2014, is a series of four tournaments sponsored by Potawatomi nation tribes. There is a $40,000 pool of incentive money that the players can earn based on performance at the four events (Four Winds Invitational, Island Resort Championship, FireKeepers Casino Hotel Championship and PHC Classic). The player with the most points after the PHC Classic will earn a $6,000 bonus. The player that wins the PHC Classic will earn 500 points. Second place receives 300 points. Min Seo Kwak (2014), Annie Park (2015) and Laura Gonzalez Escallon (2016) won the first three years. • Edgerton native Allyssa Ferrell will throw out a ceremonial first pitch at the Milwaukee Brewers game on Thursday afternoon against the Cardinals. Game time is 1:10 p.m.